A few days ago Brian Schaffner broke down some pretty deep data from the Cooperative Congressional Election Study to figure out that 12 percent of Sen. Bernie Sanders primary voters ended up voting for Donald Trump last November. Most of the attention on this data so far has focussed on three rustbelt states where the Sanders voter splitting would have put Hillary Clinton over the top. But the data set also attached locations to each voter it tracked, so it was possible to draw a map of where these Sanders-to-Trump folks lived. And, guess what, Shelton I'm looking at you. Overall, there were very few Sanders to Trump voters. Only 2.3 percent of voters in Washington that said they voted in a primary or precinct caucus for Bernie Sanders said they voted for Trump. That's obviously way less than the national average. But you can read a few lessons from the map. Because of the low number of Sanders/Trump voters, most zip codes only had one survey respondent. Except for Shelton, which had three. I was surprised that Grays Harbor and Pacific counties didn't report back any Sanders/Trump voters. One of storylines from last year was that those counties especially were attracted to Trump because of how his rhetoric lined up with their traditionally Democratic roots. 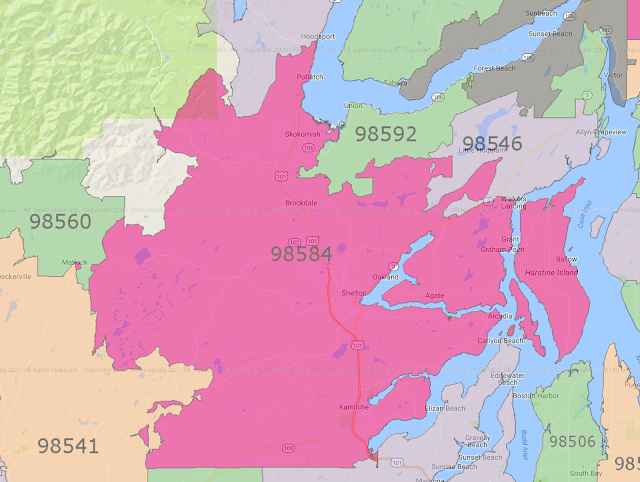 I also noticed a pattern in the Puget Sound zipcodes that recorded a Sanders/Trump voter. Only two of them were urban zip codes, despite having most of the population. The majority of them were in rural areas near the urban core. I wonder if there's something to read into that.